Budapest, Hungary (AP) — Starting from pole position on a tight circuit that severely limits overtaking, Ferrari’s Sebastian Vettel will be confident of his fourth win of the season in Sunday’s Hungarian Grand Prix. Especially with archrival Lewis Hamilton fourth on the grid. Ferrari secured a 1-2 in Saturday’s qualifying, with Kimi Raikkonen second, but the twisting Hungaroring circuit did not suit the Mercedes drivers. Valtteri Bottas qualified third, while Hamilton was nearly half a second behind Vettel’s time of 1 minute, 16.276 seconds. Having won the British GP from pole position two weeks ago, Hamilton hoped to carry that form over to Hungary. Instead, he missed out on equaling Michael Schumacher’s all-time pole record of 68. The three-time F1 champion must now wait until after the month-long summer break for another shot at that. He trails four-time F1 champion Vettel by one point overall, but his chances of moving into the outright lead, heading into the break, appear bleak. And that is in his opinion. If Vettel gets away cleanly on the long straight up to Turn 1, Hamilton will be up against it on the most difficult track for overtaking in F1, along with street circuits Monaco and Singapore. With temperatures expected to reach 35 degrees Celsius (95 degrees Fahrenheit) during the race, and asphalt track temperatures way higher, tire degradation could possibly become a factor. If it comes down to pure racing speed, and with no incidents, Ferrari looks to be the clear favorite on Saturday’s evidence. Raikkonen was .168 behind in front of many flag-waving Finnish fans. Bottas was .254 behind Vettel; Hamilton trailed by .431. 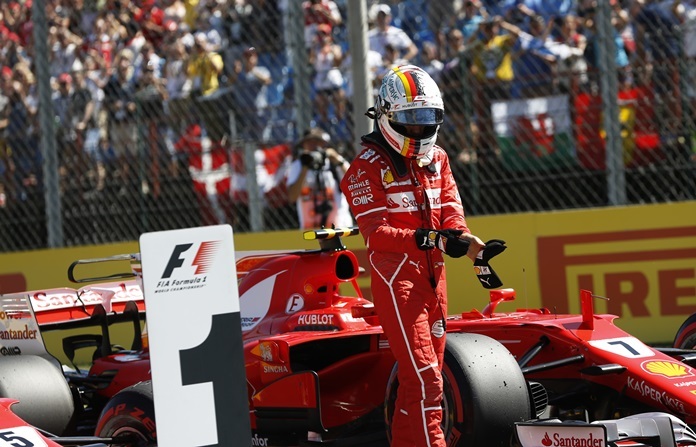 It’s some change from how Vettel felt after the British GP, where he finished in seventh. This time, Mercedes is on the back foot. Max Verstappen will start from fifth — ahead of his Red Bull teammate Daniel Ricciardo, whose car was repaired after breaking down during the third and final practice session on Saturday morning. Fernando Alonso qualified in a promising eighth for McLaren, which has been struggling with Honda engines. He was an emergency late replacement for Felipe Massa, who pulled out after complaining of “dizzy” spells following Friday’s practice. Di Resta placed 19th, relegating Sauber driver Marcus Ericsson to last. But with his father, Anthony, watching on, Hamilton shot to the top of the leaderboard right at the end of Q2, raising hopes of a pole. Hamilton led early into Q3, only for Vettel to go even quicker and draw a roar from the crowd taking in the sunshine around the 4.4-kilometer (2.7-mile) circuit nestled in the hills surrounding Budapest. Earlier, Vettel set the fastest time in third practice ahead of Raikkonen. It proved an indicator of what followed in qualifying, and what might lay ahead in Sunday’s race.